Quick: How did you get to our blog? Did you click on a link via Twitter, or see the article pop up in your RSS reader? However you arrived here, you probably used around 180 KB of data to load this webpage. Though somewhat intangible, and certainly not of upmost concern to most of us and our rapid-fire browsing, data requires huge amounts of energy to process. Data centers power our appetite for data at all hours of the day. They are the physical embodiments of our everyday data usage – using Google or Yahoo! to search the most recent March Madness upset, posting photos of a recent vacation to Facebook, loading an app on the new iPad 3 - and like every other structure, they can (and should) be built green. For that reason, we’ve adapted LEED for New Construction and LEED for Existing Buildings: Operations & Maintenance to the particular needs of data centers to ensure that new construction and facility retrofits can successfully pursue and apply LEED. What makes data centers such a unique project type? Data centers have very few occupants, and they are huge energy users: a data center can use as much energy as a small town (really). Whereas a typical building is designed to meet heating and cooling needs for occupant comfort, a data center must provide massive cooling power for its servers. Water use is also a key target area for data centers, if the facility utilizes water for cooling. These specific building needs are built in to the data center adaption for LEED. Recently, there’s been a surge of LEED-certified data centers: Among them, Facebook, Yahoo!, Internap and QTS. 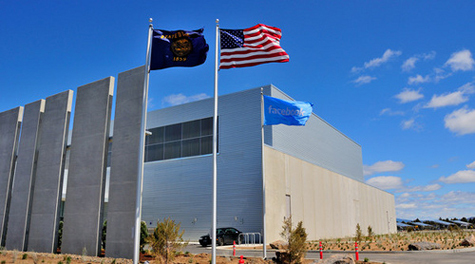 Facebook’s first energy efficient, LEED Gold data center in Prineville, Ore. uses 70 percent less water for cooling purposes than an average data center. Apple’s LEED Platinum data center in Maiden, NC, utilizes outside air cooling so that facility chillers can be turned off 75 percent of the time. All of these projects are leading the way in how we think about this project sector. By bringing data centers into the suite of LEED rating systems, we’re removing barriers so that even more data facilities can participate in LEED and build sustainably. Read more about the adaptations for data centers and other market tracks, and be sure to weigh in on these changes to LEED in public comment, now open until Mar. 27. I think we take for granted the amount of energy it takes to generate one Google search or to pursue any sort of online activity. I'm glad to see that Facebook has recognized their energy usage rate and acted accordingly. Follow our signals right now & gain up to 270% a day. Did you know you can get them ON AUTO-PILOT AND TOTALLY FREE by registering on Like 4 Like? BlueHost is ultimately one of the best website hosting provider for any hosting plans you might need.